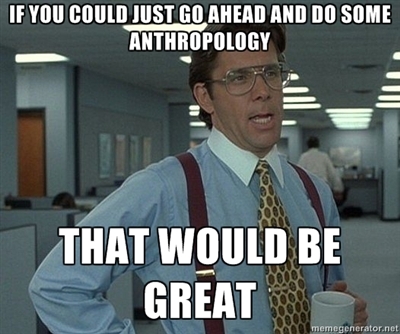 For a recent graduate from a small liberal arts college like myself, the AAA Meeting will be my first exposure to the massive community of practicing anthropologists who explore everything from food culture to feminism, pedagogy and praxis to protest politics, sovereignty to sociolinguistics. Spanning December 3-7, I’m already putting aside extra money for the innumerable coffee runs I’ll be making throughout the days, considering that panels, open meetings and discussion sessions are held from 7:30 in the morning to 10:30 at night, a sort of intellectual marathon. Like a proverbial kid in a candy store, I’ve been perusing the AAA website ever since the 2014 program was released, smacking my lips at the panoply of options at my disposal, already wishing I had Hermione Granger’s time-turner so I could attend multiple panels at once. As an anthropologist who is interested in gender studies, medicine, literature, religious and activist anthropology, I’m particularly looking forward to panels like “Activism and Advocacy,” “Ethnographic Storytelling,” “Anthropological Approaches to Law, Gender and Human Rights,” and “Medicalizing Religion, Spiritualizing Medicine.” But there are also a number of panels and workshops that fall within the category of geek anthropology, like “Performance, Translation, and the Creation of Worlds,” “Modern Monsters Panel I: Anthropology and the Ecology of Anxiety” and the Society for Humanistic Anthropology’s workshop on “Utilizing Facebook for Ethnographic Research.” Anthropologists are increasingly acknowledging and adapting to the digital of the 21st century, and there are a number of panels negotiating the role of cyberspace in fieldwork, digital technology in modern culture and methodologies, as well as cultural communities converging through the Internet. Anthropologists are pushing toward the future, rather the past, posing speculative questions about human kind. As per Savage Mind’s advice, I’ve accumulated a number of scarves and sturdy boots for the occasion. Having interviewed several important anthropologists while they were wearing nothing but yoga pants and an oversized Smithsonian t-shirt, I’m going to try to strike a professional balance of kooky-cool. I will, however, be geeking out with my fellow editors and trying to stay calm when I spot some of my intellectual crushes. “I just looooooove your theories on kinship and the body.” I may even start live tweeting things overheard throughout the conference, especially during the open bar events. No bones about it, I am totally pumped. It’s gonna be like Comic Con for social scientists, right?